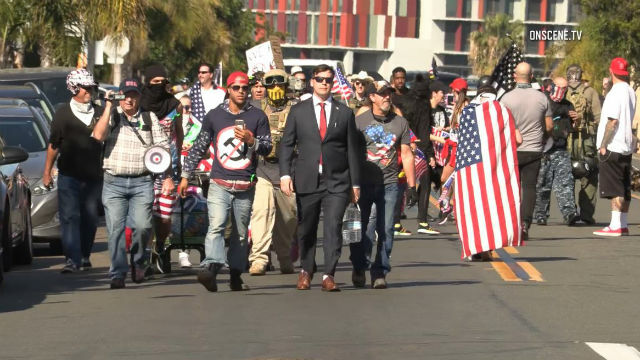 Egg-throwing and at least three arrests were the result of dueling demonstrations Saturday at Chicano Park, where a group calling for the American flag to be displayed at the Latino landmark was met with hundreds of counter-protesters. The San Diego Police Department said one of the arrests occurred after an officer was punched in the face. A few dozen protesters, part of an event dubbed Patriot Picnic by the group Bordertown Patriots, gathered at the park at about 9 a.m. to call for raising the American flag over the site beneath the San Diego-Coronado Bridge in Barrio Logan. The park features colorful murals depicting various elements of Mexican and Mexican-American culture. Counter-protesters also showed up, and police estimated their numbers at about 700 people. Police separated the two sides with officers, barriers, yellow tape and the entire width of Logan Avenue. “It’s not that we think it should be the only flag that’s flying, but the Mexican flag shouldn’t be the only flag that’s flying,” she said. A flag representing Aztlan — the legendary homeland of the Aztecs — usually flies over Chicano Park. For some of the counter-protesters, though, it was more personal than a fight over a flag. One of the Bordertown Patriots, Jourdin Davis, said he traveled from the Bay Area to take part in the demonstration. The two sides were kept separated enough that there were few chances for them to come into contact with each other. But once the Patriot Picnic attendees began leaving, police had a harder time preventing interactions. Two protesters began striking each other with a motorcycle officer in between them. One person threw eggs at the Bordertown Patriots group as they walked north on Logan Avenue. Nicole Orsi, one of the counter-protesters, said she was there because she heard “white supremacists” were going to be demonstrating at the park. Bordertown Patriots representatives said that no white supremacists were at their event, and any who showed up would have been kicked out. “Those are rumors that were debunked on the spot. There’s no neo-Nazis or white supremacists here at all, or anybody who stands behind that philosophy,” Davis said. 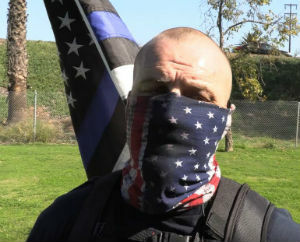 I just wanted to come down here and support the message, which is just coming to the park, having a nice, peaceful picnic at a park that’s still on American soil. San Diego City Councilwoman Georgette Gomez said she was at the counter-protest to support the neighborhood she was born in. The dispute over the flag, she said, should be a non-issue.